The Hammer Candlestick is a bottom reversal signal, and kind of looks like a hammer with its head and handle. The Japanese word for hammer is takuri, which means "trying to gauge the the depth of the water by feeling for its bottom." This is a perfect analogy for this candlestick stock charting pattern, as the market attempts to look for the bottom. Since this candlestick formation is a bullish reversal signal, it must come after a falling trend, even a short term decline. There is a sharp sell off after the market opens during a downtrend. However, by the end of the trading day, the market closes at or near its high for the day. This signifies a weakening of the previous bearish sentiment, especially if the real body is white (the close is higher than the open price). Since the certainty for a Hammer indicator is low, the trend reversal can be confirmed by a higher open and an even higher close on the next trading day. If the open and the close are identical, the indicator is considered a Dragonfly Doji. The Dragonfly Doji has a higher reliability associated with it than a Hammer. The hammer candlestick pattern is also used to confirm support. 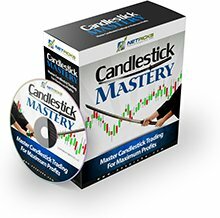 Return from "Hammer-Candlestick" to the Home Page: "Stock Market For Beginners"